A spacious building which is situated behind the village green and is signposted off the Main Road. The hall can accommodate 200 in the main room, 100 in the extension and 10 in the committee room and has a stage with dressing rooms. There is a large car park adjacent to the hall. The hall itself comprises of two sections; a large and a smaller hall which can be divided off by folding doors. The floor is a sprung wooden floor; ideal for dancing. The building is equipped with a modern fitted kitchen, new appliances, a microwave, dishwasher, fridge/freezer, double oven and hob. There is a separate designated bar area. Disabled toilet facilities are available. The building has the benefit of full central heating and is equipped with a loop system for those with impaired hearing. 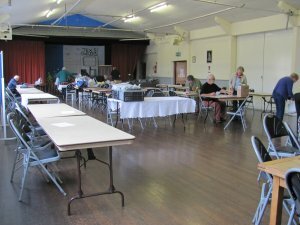 The hall is currently the regular venue for The Cherwell School of Dancing, short mat bowls, the W. I., Age Concern and is the home for the local amateur dramatic group, The Lynden Players, whose stage productions are performed here.